When the climate is mild, birds fly over the sky, through the parks are Elephants, prides of lions, leopards, buffaloes, hippos and crocodiles at the banks of the Nile, you know you are in the Pearl of Africa-Uganda. Christened the Pearl of Africa by Winston Churchill, Uganda pride’s in being home to diversity ranging from flora, fauna and avian species making it a prime Africa safari destination. When planning a safari to Uganda, its always about the safari parks yet the 10 of them aren’t the only hosts to the profuse wildlife within the country. Uganda has 13 reserves that are for conservation of wildlife and here I bring to you details about Toro Semliki Wildlife Reserve, a hidden gem you should uncover on a trip. Established in 1929 to protect the large number of Antelopes especially the Ugandan Kobs that dominated the area then, Semliki wildlife reserve is one of the oldest protected natural areas in Uganda. Semliki wildlife reserve was once one of the best stocked and most popular reserves for wildlife tours in Uganda. The adorned Semliki Wildlife reserve is located in western Uganda within the districts of Ntoroko and Kabarole. The reserve enjoys a beautiful position at the rift valley floor where Lake Albert, the Rwenzori mountains and the Kijura escarpment create backdrops for the reserve neighboring creating an amazing scenery. The reserve is set at a relatively low altitude of 700m above sea level covering an area of 542km2. The Toro Semliki reserve area has a mixture of the Central African rainforest and East African savanna which create both a lovely landscape and diverse habitat boosted by the Eastern escarpment of the great rift valley. The reserve has numerous wildlife with primate species including chimpanzees(occasionally), Red-tailed, vervet, black and white colobus monkeys, Baboons. Other mammals include Waterbucks, warthogs, Bushbucks, Buffaloes, lions (since 2005 the reserve is considered a lion conservation area), Uganda Kobs, elephants, giant forest Hog. The elephant population at the reserve includes both the savannah and forest elephant species. 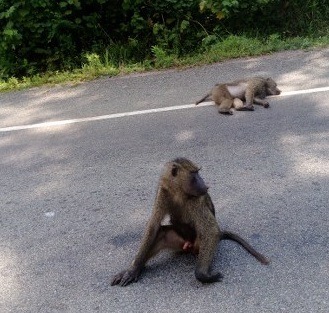 These can be seen on a Uganda wildlife safari within the reserve. Bird species in Semliki wildlife reserve add up to 400 species including the Arrow Marked Babbler, Tropical Boubal, Black-headed Bushrike, Luhdrers Bushrike, Red necked Falcon, Black-billed Barbet, the turkey like Ground Hornbill, Tropical Boubal. 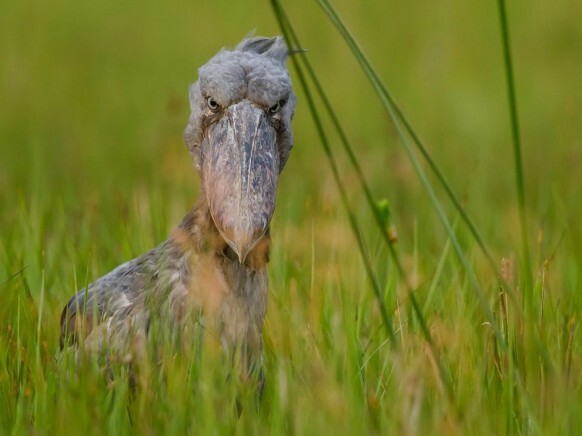 The most sought-after bird -shoebill can also be seen in the marshes of Lake Albert with many more that are loved by birders on birding safaris in Uganda. The scenery around the Semliki rift valley floor is beautiful with the sheer rift valley escarpment that rises sharply from the eastern shores of Lake Albert, the 250m high Congolese blue mountains on the western horizon and the snow-white glacial peaks of the towering Rwenzori mountain to the south west an amazing fairy tale like scene for nature lovers on Uganda safari tours. The vegetation is comprised of open acacia -combretum woodland and grassy savannah, interspersed with patches of borassus palm forest, significant belts of riparian woodland as well as some extensive swamps. Game drives through Semliki wildlife reserve is a perfect way to get up close to wildlife like chimpanzees(occasionally), Red-tailed monkeys, vervet monkeys, black and white colobus monkeys, baboons, buffaloes, lions, Waterbucks, warthogs, Bushbucks, Buffaloes, Uganda Kobs and elephants, giant forest Hog. On a lucky Uganda wildlife tour, day sighting of the leopards and elusive bush babies are possible. Nature walks through the reserve with a variety of habitats ranging from savannah woodland to riverine forest that gives home to wildlife. During nature walks Ground Hornbills, warthogs, Uganda Kobs, baboons, monkeys are sighted. 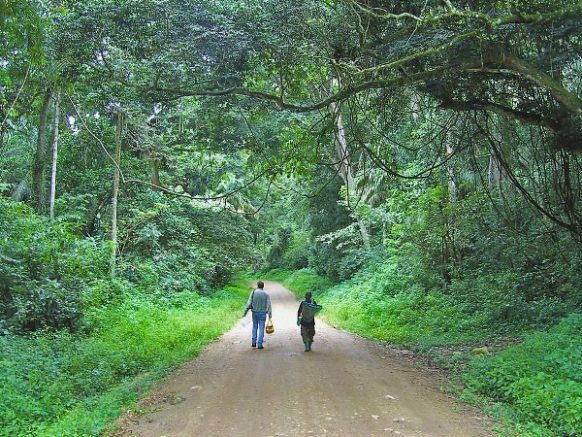 Night walks through Semliki wildlife reserve on Wildlife tours in Uganda will take the tourist to the bush after dark where one sights nocturnal mammals like the white-tailed mongoose and many specials of the wild with no guarantee of what one bumps into. The perfect time for bird watching by any passionate birder is during the hike and definitely a keen birder will surely tweet when they sight the many 400 bird species. The must tick birds for birders on a Uganda birding safari itinerary include the Arrow Marked Babbler, Tropical Boubal, Black-headed Bushrike, Luhdrers Bushrike, Red necked Falcon, Black-billed Barbet, the turkey like Ground Hornbill, Tropical Boubal and the shoebill in the marshes of Lake Albert. The boat cruise is extended to Lake Albert outside the reserve where aquatic mammals are sighted including the crocodiles and hippopotamuses. Hike through the 7km Nyaburogo Gorge trail with a diversity of habitats in the gorge ranging from open acacia -combretum woodland and grassy savannah, interspersed with patches of borassus palm forest, significant belts of riparian woodland as well as some extensive swamps. If you want to get close to the locals in Uganda then you can have a visit during a tour to this reserve. The amazing communities around Toro-Semliki reserve include the Karugutu-Kyabandara community in the south occupied by the Bakonjo cultivators, Rwebisengo community in the west and north western edge of the rift valley covered by Batuku pastoralists, the Ntoroko fishing community in the south-eastern tip, Kasesenge-Kyakabaseke community in the eastern escarpment of the rift valley occupied by the Bakiga migrants with unique cultural practices. The best time of the year for Uganda wildlife tour to Toro Semliki wildlife reserve is during the month of January, February, June, July, August and December when the rains are low. Wildlife reserves can surprisingly offer much more than you expect. Masaai Mara Game Reserve in Kenya for instance has a profusion of wildlife and one of the best spots to have an encounter with one of the seven natural wonders-the wildebeest migration that happens between Masaai Mara and Serengeti National Park in Tanzania on an annual migration. Looking for a relaxing safari filled with wildlife and bird memories? Plan a safari to Uganda and have a blissful experience with tailor made safaris to Toro Semliki wildlife reserve.